Can live in small apartment, but needs lots of exercise. Truly a people dog. The Golden Retriever dream began in the mid-1800’s, a single Scottish gentleman began the breeding program that would result in these precious dogs. A Tweed Water Spaniel (now obsolete), Irish Setter, and a small Newfoundland, were cross bred until a medium-sized dog emerged. This dog was a strong swimmer capable of withstanding cold water, able to navigate through heavily vegetated shorelines, and return with the game held securely in a soft mouth. First called Yellow Retrievers, the Golden Retriever was first shown in 1904. Goldens are friendly dogs, extremely trustworthy. They do well with children, and no one is long a stranger to a Golden. They are retrievers, so enjoy catch, frisbee and carrying all manner of things in their mouths. Retrievers are water dogs — they ike to swim, splash or just chase fish. They don’t do well as couch potatoes, nor do they thrive out in the backyard alone. Given a choice, these dogs would prefer to be with their owner than with another dog. They are PEOPLE dogs. 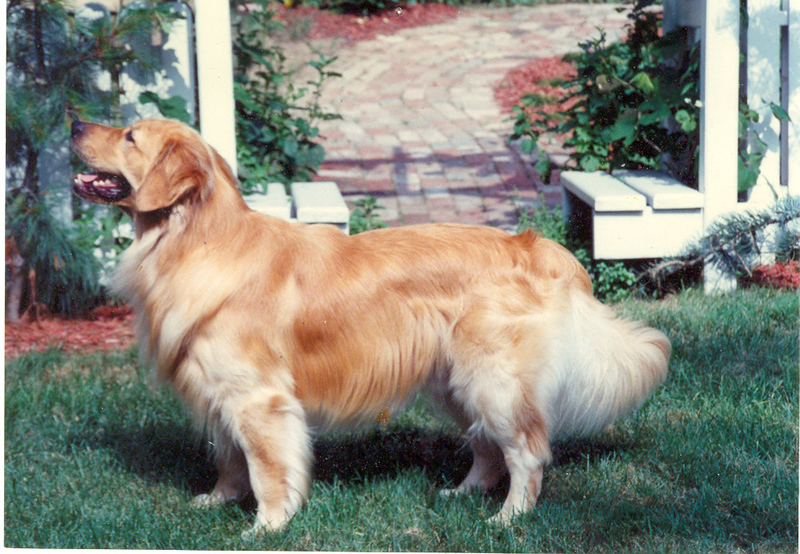 Retrievers have full coats with heavy feathering on the chest, tail and legs. Weekly, if not daily, grooming is essential. One of the ten most intelligent breeds, Golden’s are easily trained. They are alert, eager and self-confident. According to the AKC standard, Golden’s are medium-sized dogs with males standing 23-24 inches at the withers and weighing 65-75 pounds; females stand 21½-22½ at the withers and weigh 55-65 pounds. Coats are rich and lustrous in shades of lightest gold to tawny red. White markings that don’t suggest aging are a disqualification from the show ring. The fur is water repellant, and double-coated. Moderate feathering on back of forelegs an underbody with heavier feathering on front of neck, back of thighs, and underside of tail. A Golden’s head is broad in he skull. The muzzle is straight. The tip of the ears should just cover the eyes when pulled forward. Teeth should sit in a scissor bite. Golden Retriever Magic A comprehensive site with all you need to know about the Golden Retriever. It includes pictures and information about breed history, facts, safety, nutrition, naming, training, and selecting breeders [PGAA Note: PGAA has not sceened any of the breeders listed on this site and we strongly recommend that any breeders be thoroughly reviewed by the buyer prior to purchasing]. 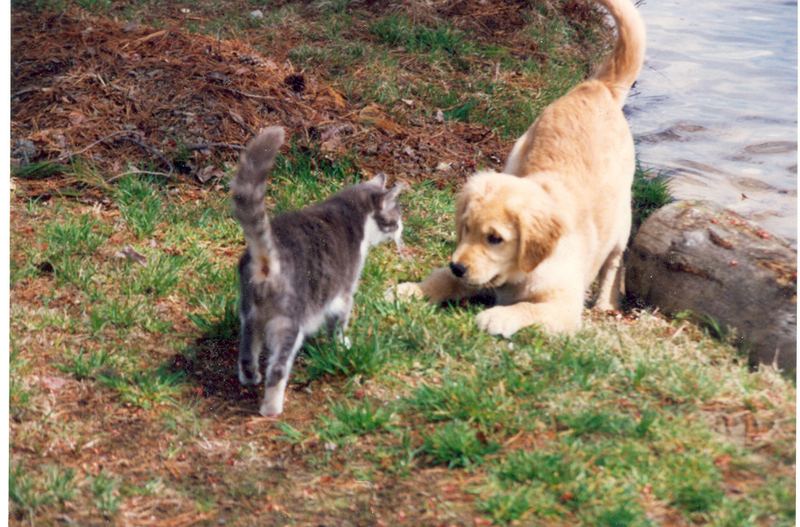 The Goldstock Fund Aid for Goldens and mixes. The Land of Pure Gold Great Site!